Welcome to the Cheeky Craft Chick Blog! I will do my damnedest to post at least once a week. I am aiming for Sundays, as that is my usual “down day” and I rarely have to leave the house. Good time to take pictures of my latest project or find something particularly cute and quirky on the interwebs to post. “Craft” entails any creative endeavor I see fit to include. I will warn you now, this will include sewing clothing, cooking, painting, and refreshing or re-purposing furniture. I feel most of these types of creative home projects and more traditional crafts are similar in nature, and I get a similar type of pleasure from doing them. I will post an assortment of my personal crafting projects, as well as ideas, articles, or pictures I find on the web that might be interesting to home crafters. I originally thought to post a craft a week that I had completed, but I need to be realistic and acknowledge that as much as I would like to have that level of personal output, I have a full time job and a husband. Both take a fair amount of time. Unfortunately, neither overlaps with crafting. 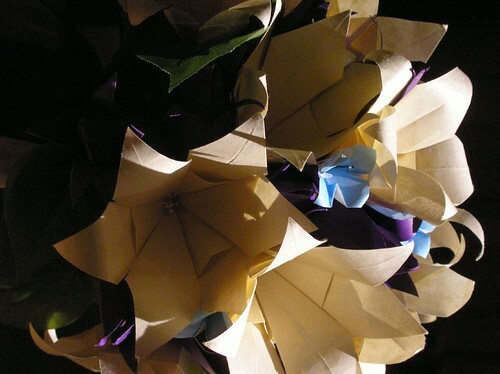 So, without further ado, I thought I’d kick things off with a crafty item I made for my wedding in 2007. Fresh flower prices being what they are, I was looking for something interesting and creative to substitute for the fresh bouquet of flowers the bride normally carries down the aisle. I liked flowers, and some other suggestions (a favorite book, a meaningful keepsake) just didn’t do it for me. 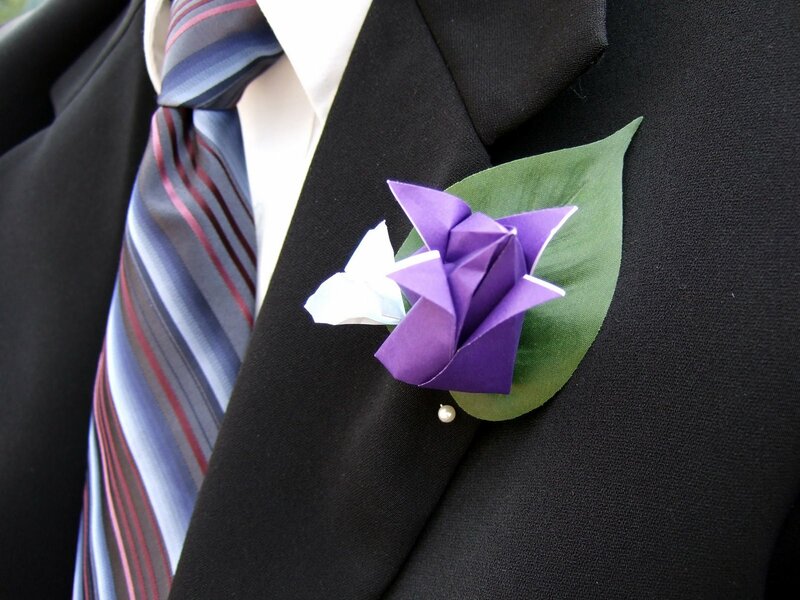 I remembered high school and my days experimenting with origami, and EUREKA! 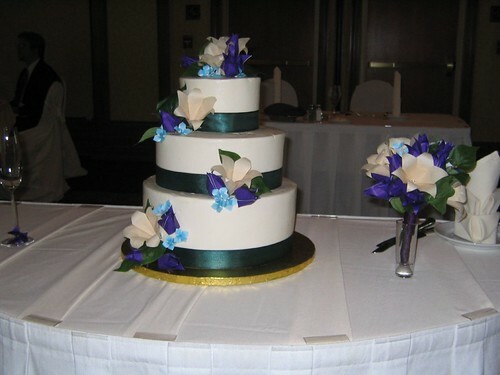 I did a combination of purple tulips, baby blue 4 petal flowers and cream colored 6 petal lilies. My bouquet is shown above. I also made bouquets for the bridesmaids, corsages and boutineers for the VIPs of the day, flowers for the cake, and favors for our guests. 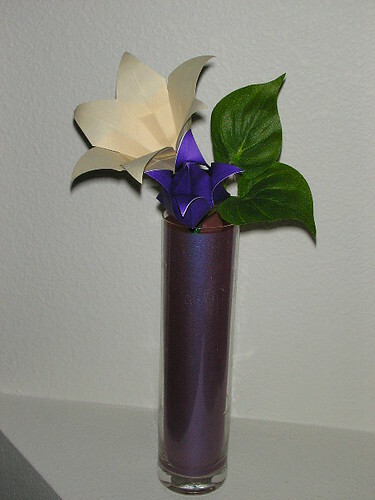 The Guests’ Favors – a small cylinder vase with origami flowers. Our cake and one of the bridesmaid’s bouquets. Close up of the top of the cake. The paper cost about $40.00 total. Flower stems, leaves, and crafting supplies came to about another $50.00. So for the cost of what one bride might pay for her bouquet alone, I had flowers for my entire bridal party, myself, my guests, and the cake. 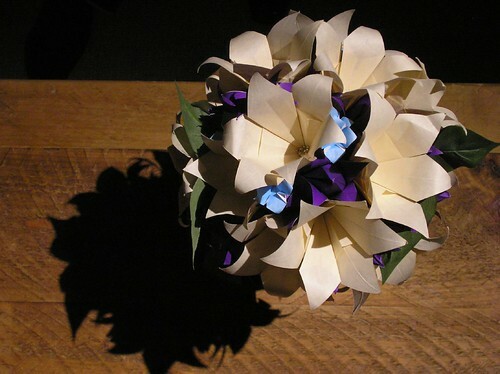 The flowers took about 6 months to fold, which I usually did when watching movies with my husband. 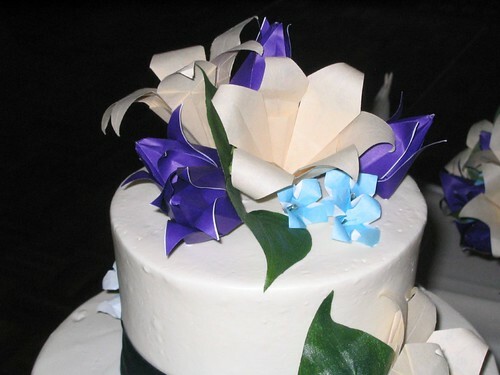 I believe I folded 800 little blue flowers, 200 tulips, and 100 lilies – not all of which were used, but most were. The flowers were a huge hit. Towards the end of the reception, we had a few friends and family members taking any of the extra favors the other guests had left behind. I love visiting them now and seeing their bunch of flowers from our wedding proudly displayed in their living room. My own bouquet is proudly displayed in my living room and still looks as fresh and beautiful as the day I walked down the aisle. 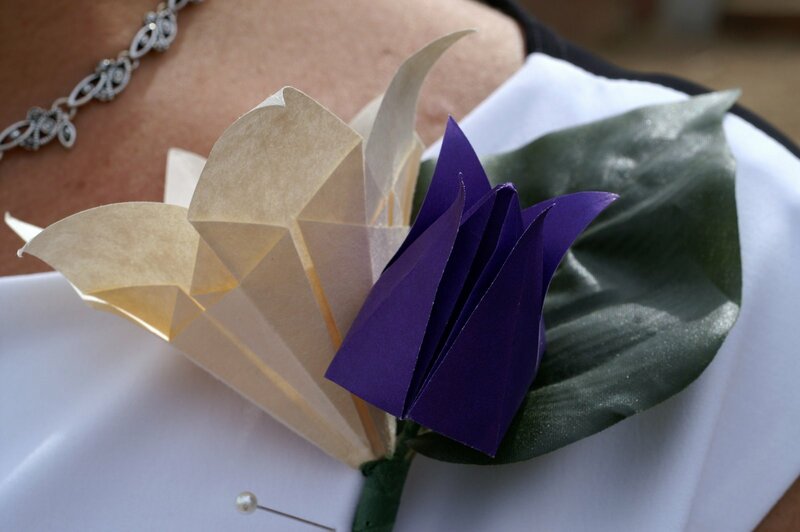 The banner for this site shows another lovely picture of my bouquet. This craft certainly is one of my favorites, not only for its beauty and practicality, but also for it’s modern romantic flair. Here’s one more glamor shot to send you on your way. Happy crafting!